Do you know where your shipment is once it leaves the warehouse and if the cold chain hasn’t been broken? Tagging technologies such as barcodes or RFID provide visibility within warehouses, and WiFi networks can connect sensors to the Internet. However, visibility in the digital supply chain quickly degrades between readers. Shipments can fall off the map for days, if not weeks, until appearing again at a warehouse, if they actually get scanned at all! Low Power Wide Area Networks (LPWANs) are a relatively new type of communication technology for low-power, long-range, low-bandwidth communication. Such devices can operate autonomously for months, even years, and provide regular and autonomous connectivity to the digital supply chain, where previously there was no coverage because established track and trace technologies are either unavailable or impractical to deploy. Recently, we announced our partnership with Sigfox, the global LPWAN provider. Today, we are delighted to announce our partnership with UK-based LoRa provider Things Connected. 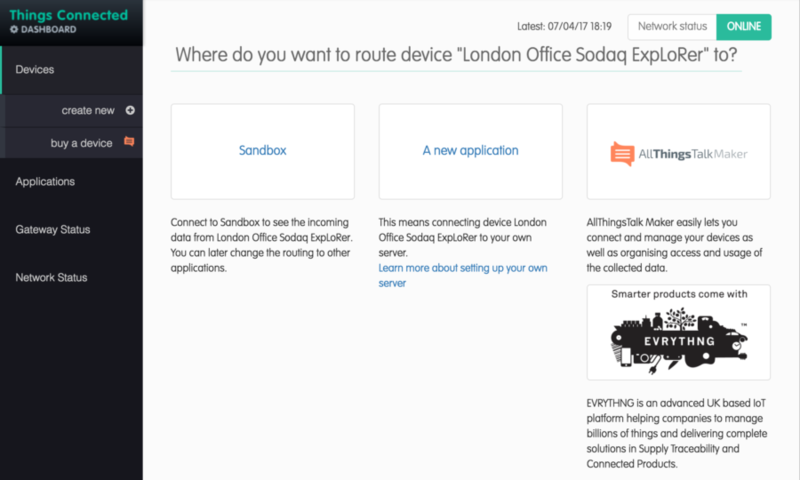 Things Connected is a subscription-free UK-based LPWAN platform. Part of the Digital Catapult program, Things Connected’s mission is to foster and support innovation for SMEs, local businesses and local communicates. Things Connected is LoRa-based. LoRa is an open LPWAN protocol promoted by the LoRa alliance and implemented by several network providers for things such as Things Connected. Making a Things Connected device work with EVRYTHNG is quite straightforward. When you create a new device on the Things Connected dashboard, you’ll be given the option to route messages to the EVRYTHNG platform. If you already have a LoRa device and would like to use it with your EVRYTHNG account, please consult the Things Connected integration readme. We are excited about the potential of this integration as EVRYTHNG now transparently connects to multiple LPWAN technologies, ensuring that our customers are not bound to a specific LPWAN provider and that a Thng can switch between LPWAN technologies and networks when need. EVRYTHNG is actively looking for partners who would like to test this technology based on the free Things Connected UK network. Contact us if you would like to learn more about the opportunity.